We specialize in the refinishing and complete restoration of antique furniture. With over 20 years experience repairing everything from water and fire damage to scratches, gouges and re-veneering, we can make your piece truly shine! 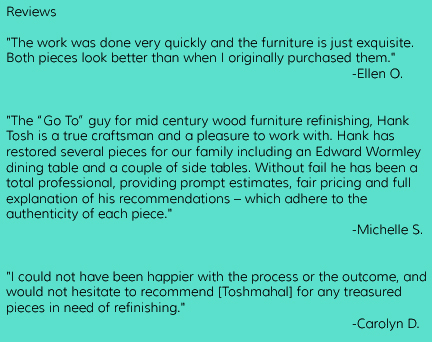 "I have been doing furniture restoration and refinishing in the Dallas area for over 20 years now, professionally and even before that as an apprentice. I work on what I love so it has become a huge passion of mine to take something that is in dire need of TLC and make it beautiful again. I have always been interested in antiques, particularly mid century modern, and collected and restored many of my own pieces before I started this business." and respected craftsman at a local antique store, doing grunt work -- sanding, stripping, a little staining. He taught me a lot. 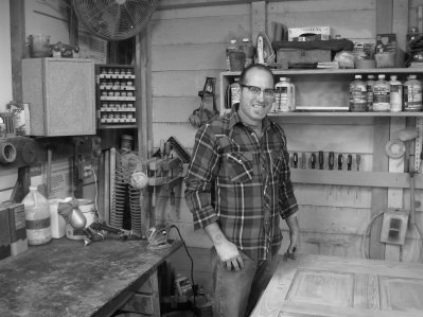 The rest I've learned by reading everything I can get my hands on, lots of trial and error and my trusty friend and mentor Rick Wood, a 3rd generation craftsman, who learned from his father." "Currently I've set up shop in the Dallas Design district. We stay really busy, with new projects coming in every day. Its great to see all this stuff get transformed, I strive to get each piece as close to mint vintage condition as possible. I've always been excited to see the final outcome of a piece once its restored but the growing interest in mid century furniture makes it that much more rewarding."